Congress is required by Article I, Section 6, of the Constitution to determine its own pay. Prior to 1969, Congress did so by enacting specific legislation. From 1789 through 1968, Congress raised its pay 22 times using this procedure. Members were initially paid per diem. The first annual salaries, in 1815, were $1,500. Per diem pay was reinstituted in 1817. Congress returned to annual salaries, at a rate of $3,000, in 1855. Specific legislation may still be used to raise Member pay, as it was most recently in 1982, 1983, 1989, and 1991; but two other methods—including an automatic annual adjustment procedure and a commission process—are now also available. The Ethics Reform Act of 1989 established the current automatic annual adjustment formula, which is based on changes in private sector wages as measured by the Employment Cost Index (ECI). The adjustment is automatic unless denied statutorily, although the percentage may not exceed the percentage base pay increase for General Schedule (GS) employees. Members of Congress last received a pay adjustment in January 2009. At that time, their salary was increased 2.8%, to $174,000 from $169,300. A provision in the FY2009 Omnibus Appropriations Act prohibited any pay adjustment for 2010. Under the pay adjustment formula, Members were originally scheduled to receive an adjustment in January 2010 of 2.1%, although this would have been revised downward automatically to 1.5% to match the GS base pay adjustment. Members next were scheduled to receive a 0.9% pay adjustment in 2011. The pay adjustment was prohibited by P.L. 111-165, which was enacted on May 14, 2010. Additionally, P.L. 111-322, which was enacted on December 22, 2010, prevented any adjustment in GS base pay before December 31, 2012. Since the percentage adjustment in Member pay may not exceed the percentage adjustment in the base pay of GS employees, Member pay was also frozen during this period. 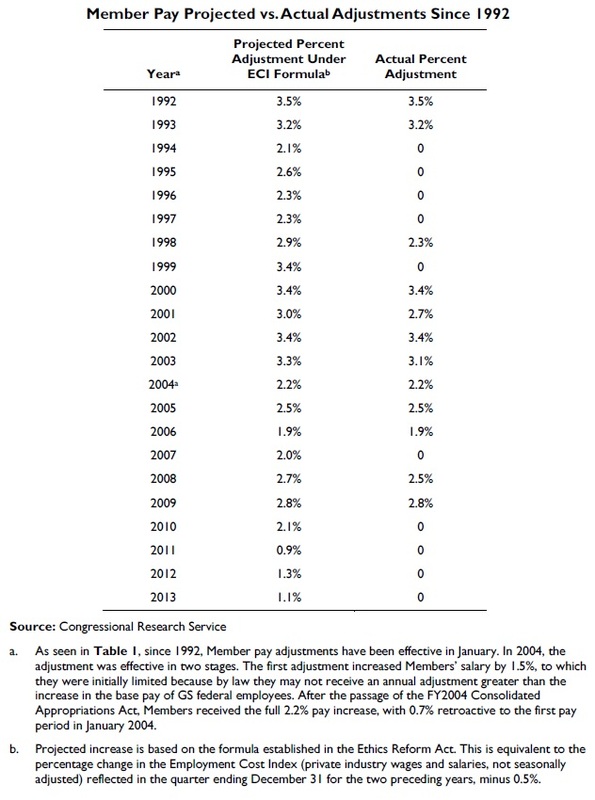 If not limited by GS pay, Member pay could have been adjusted by 1.3% in 2012. The ECI formula established a maximum potential pay adjustment in January 2013 of 1.1%. Section 114 of the Continuing Appropriations Resolution, 2013 (H.J.Res. 117, P.L. 112-175, enacted September 28, 2012), extended the freeze on GS pay rates for the duration of this continuing resolution, which also extended the Member pay freeze since the percentage adjustment in Member pay may not exceed the percentage adjustment in the base pay of GS employees. Subsequently, Member pay for 2013 was further frozen in H.R. 8, the American Taxpayer Relief Act of 2012, which was enacted on January 2, 2013 (P.L. 112-240). The maximum potential 2014 pay adjustment is 1.2%, or $2,100. Prior to 1984, neither federal civil service employees nor Members of Congress paid Social Security taxes, nor were they eligible for Social Security benefits. Members of Congress and other federal employees were instead covered by a separate pension plan called the Civil Service Retirement System (CSRS). The 1983 amendments to the Social Security Act (P.L. 98-21) required federal employees first hired after 1983 to participate in Social Security. These amendments also required all Members of Congress to participate in Social Security as of January 1, 1984, regardless of when they first entered Congress. 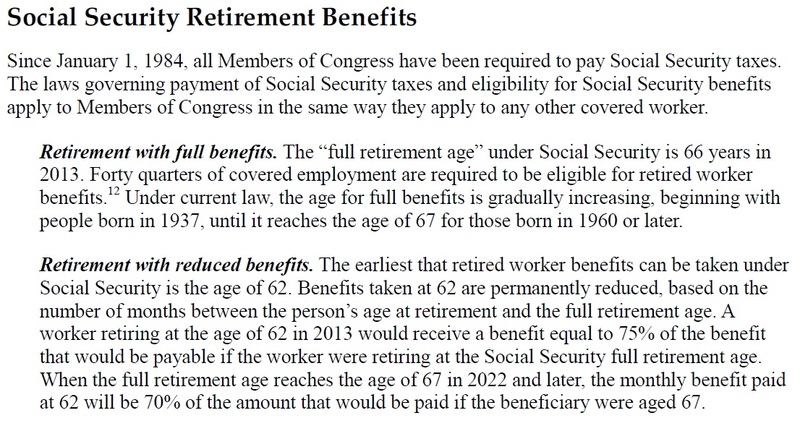 Because CSRS was not designed to coordinate with Social Security, Congress directed the development of a new retirement plan for federal workers. The result was the Federal Employees’ Retirement System Act of 1986 (P.L. 99-335). Congressional pensions, like those of other federal employees, are financed through a combination of employee and employer contributions. All Members pay Social Security payroll taxes equal to 6.2% of the Social Security taxable wage base ($113,700 in 2013). Members enrolled in FERS and elected prior to 2013 also pay 1.3% of full salary to the Civil Service Retirement and Disability Fund (CSRDF). Members of Congress first elected after 2012 and enrolled in FERS contribute 3.1% of pay to the CSRDF in addition to their Social Security contributions. In 2013, Members covered by CSRS Offset pay 1.8% of the first $113,700 of salary, and 8.0% of salary above this amount, into the CSRDF. 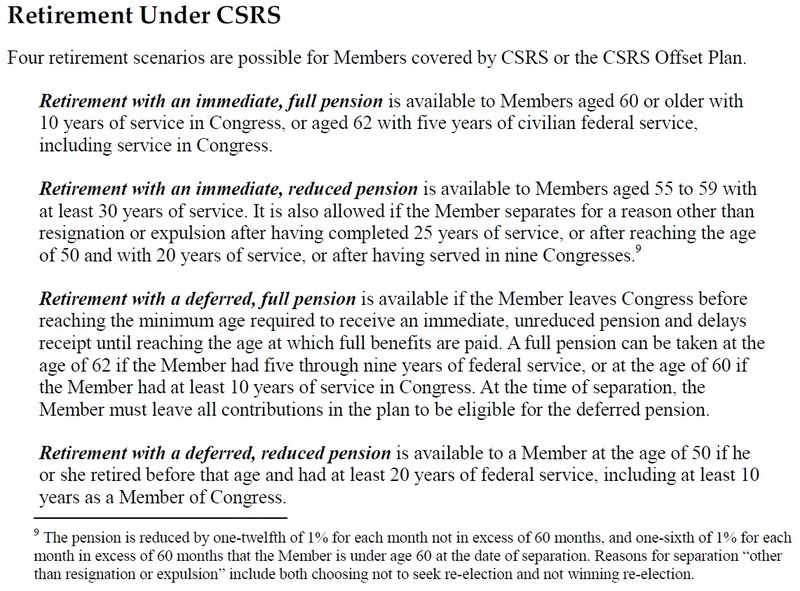 Under both CSRS and FERS, Members of Congress are eligible for a pension at the age of 62 if they have completed at least five years of service. Members are eligible for a pension at age 50 if they have completed 20 years of service, or at any age after completing 25 years of service. The amount of the pension depends on years of service and the average of the highest three years of salary. By law, the starting amount of a Member’s retirement annuity may not exceed 80% of his or her final salary. As of October 1, 2012, 527 retired Members of Congress were receiving federal pensions based fully or in part on their congressional service. Of this number, 312 had retired under CSRS and were receiving an average annual pension of $71,472. A total of 215 Members had retired with service under FERS and were receiving an average annual pension of $40,560 in 2012. Members become vested in (legally entitled to) a pension benefit under CSRS or FERS after five years of service. The age and service requirements for retirement eligibility are determined by the plan under which a Member is covered at the time of retirement, regardless of whether he or she has previous service covered under a different plan. * Depending on a Member’s age and years of service, a pension can be taken immediately upon retirement or only on a deferred basis. Likewise, the Member’s age and years of service, as well as the starting date of the annuity, will determine whether he or she is eligible for a full pension or a reduced pension. *Active-duty military service can be counted toward retirement eligibility, but not toward five-year vesting. In order for military service to count toward the amount of one’s retirement annuity, the individual must deposit in the Civil Service Retirement and Disability Fund the amount that would have been withheld if retirement deductions had been made during the person’s years of military service, plus accrued interest on this amount. Video: Congressman Mike Coffman (Republican) calls to end the Congressional pension.